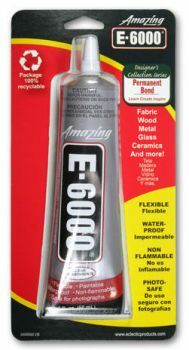 E-6000 Craft Glue 1oz Discounts Apply ! E-6000 is a unique adhesive formulated to meet high-performance industrial requirements, making it an exceptional craft adhesive. Washer/dryer safe E-6000 has excellent adhesion to wood, glass, fiberglass, ceramics, leather, rubber, vinyl and many plastics. Please read all directions before using. E-6000 should be used in a well-ventilated area. Surface should be clean, dry and free of dirt. For best results, roughen surface before use. Puncture the seal in the neck of the tube using the pointer cap. Test small area before full use. Product can be used between 50� F(10� C) and 90� F(32� C). Dry time decreases when used between 70� F(21� C) and 90� F(32� C). Clean uncured adhesive with small amounts of acetone or citrus-based solvents. Cured material may be removed by cutting or scraping. Store unused E-6000 at room temperature in a dry area. For further information, call (800) 767-4667. Always test a small area before full use on any project to ensure proper application technique and dry time. NOTE: E-6000 May damage finished surfaces. Avoid such contact until E-6000 is completely dry. Do not dry clean. Do not use on Styrofoam�. Do not use on any items that come into contact with food, drinking water, or animals. CAUTION: Contains perchlorethylene. Intentional misuse by deliberately concentrating and inhaling the contents may be harmful. WARNING: This product contains a chemical known to the state of California to cause cancer. Harmful if inhaled or swallowed. May cause dizziness, headache or nausea. Can cause skin and eye irritation. Exposure may cause damage to kidneys or liver. Cancer agent based on experimental data. Keep away from heat and flame. Contact with flame or hot surface may produce toxic gasses. Use only with adequate ventilation. To avoid breathing vapor, open all windows and doors to assure fresh air movement during application and drying. When using do not eat, drink or smoke. Avoid prolonged or repeated contact with skin. Wash thoroughly after handling. FIRST AID: If you experience difficulty in breathing, leave the area to obtain fresh air. If continued difficulty is experienced, get medical attention immediately. If swallowed, do not induce vomiting; get medical assistance. In case of eye contact, immediately flush eye with plenty of water for at least 15 minutes. For further health information, contact a poison control center.